How do we make decisions about the use of public land? Opening Reception: Wednesday, March 9, 12-1pm. 4th floor. Free. Lunchtime Panel: Saving Our Parks: Effective Partnerships between Government & Community Groups, Wednesday, March 16, 12-1pm. 3rd floor, Room 350. Free. Refreshments at both. See Magazine Beach – A Place Apart at the Mass. State House, starting this Monday afternoon (March 7). While the exhibition focuses on the forces that have shaped the Cambridge park, it explores the broader question: How do we make decisions about the use of public land? The show includes a new section, A Revitalized Park, featuring the latest landscape plans and renderings of the park and information about the Powder Magazine and DCR’s Historic Curatorship Program. On Wednesday, March 16 starting at noon there will be a Lunchtime Panel featuring effective public/private partnerships. Legislators, DCR and three community groups will present case studies of how they have partnered successfully to protect and preserve green open spaces, critical to community well-being. Magazine Beach Park in Cambridge, MA, where the Cambridgeport Neighborhood Association (CNA) has partnered with the Mass. Department of Conservation and Recreation (DCR) to study and stabilize the Powder Magazine there and now redesign and improve the western part of the 15-acre park. Upton State Forest in Upton, MA, where the Friends of the Upton State Forest has partnered with DCR, Upton, Preservation Mass. and Upton State Forest user groups to preserve the last remaining Civilian Conservation Corps camp in Mass. Southeastern Massachusetts Coastal Pine Barrens, where the Pine Barrens Partnership (PBP) is networking municipal, state and federal agencies, Native American tribes, environmental organizations and businesses to conserve this globally rare eco-region covering 26 towns and 100,000 acres. Arrive early to pass through security and to see the exhibit. For further information, go to www.magazinebeach.org. Questions? Contact Cathie Zusy at cathzusy@gmail.com or Caitlin Duffy at Caitlin.Duffy@MAhouse.gov. Magazine Beach was an island? People swam in the Charles River? That granite-block building stored gunpowder for ships in Boston Harbor? All of these questions and more will be answered to the tune of Cambridge’s finest Best Ever Chicken (bluegrass band), kite flying and races for children, learn-to-row lessons and art at Magazine Beach Park Saturday, June 15, 12-5pm. In case of rain, the art installation in the 1818 powder magazine will still be on and the music and picnic will move into the Riverside Boat Club, just across from Starbucks (at Micro Center/Trader Joe’s Plaza), on Memorial Drive. 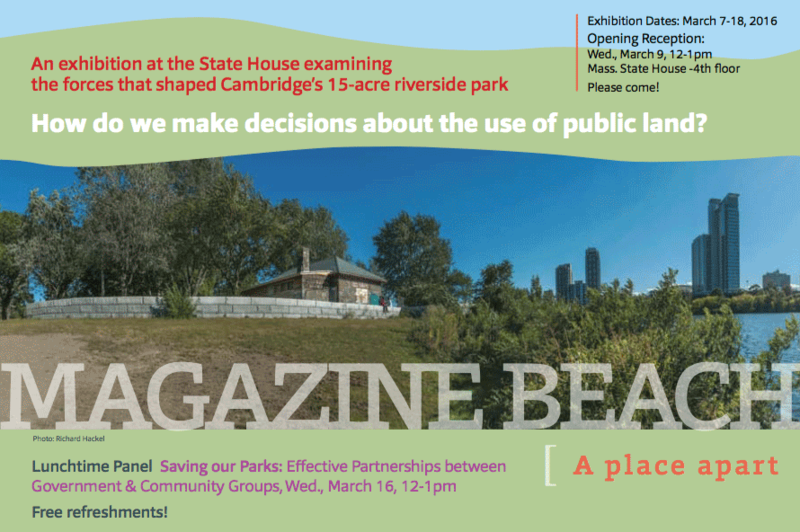 The Cambridgeport Neighborhood Association, partnering with the Massachusetts Department of Conservation and Recreation, the Charles River Conservancy, the Riverside Boat Club and many others, will offer Celebration 2013 at Magazine Beach. Their goal: to bring the community together in Cambridge’s second largest park and create an awareness of its rich history and great potential: 15 acres along the Charles River. The event is a Cambridge talent show with Artforming and Danielle Sauvé using lights and sound to transform the interior of the 1818 powder magazine into a place of memories and meditation; Nancy Adams, former head of the experimental art group Mobius, leading a performance around the magazine; public artist Ross Miller, David Craft of Gallery 263 and Lars Anderas (UMass Boston graduate student) marking the shoreline of Captain’s Island; and Cambridgeport’s own If this park could talk signs… all over the park – just for the day – revealing the site’s stories. The Riverside Boat Club, home of many rowers preparing for the Olympics, will offer learn-to-row lessons. There will be food trucks, cold lemonade, a new history of Magazine Beach, and almost everything but swimming in the Charles River. (We’re not quite ready for that.) Rain or shine, come to the park for entertainment, fun and community. It’s free! For further information, go to www.magazinebeach.wordpress.com or join us on facebook at: www.facebook.com/magazinebeach. Magazine Beach is a DCR park in Cambridge, MA, along the Charles River.